3rd row L-R Anita Maul,June Hopper,Pat Rolfe,Pauline Elliott,Lilly Bates,Carol Byford,June Clarricoats,Carol Smith,Gloria Snashell,? 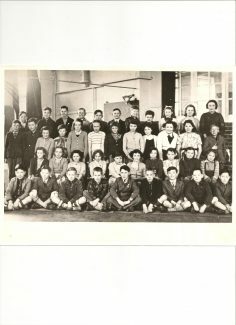 Regarding my previous comment, I’m sorry Trevor we are both wrong about the date, this photo was taken during the 1954/5 school year, (my last at Lansdowne and I can see I am wearing a prefect’s badge). I left St Chads in the summer of 1959 aged 15 to start work as an office junior at the Orient Line, so as this is Lansdowne Primary school I am sure it must be 1954/5.